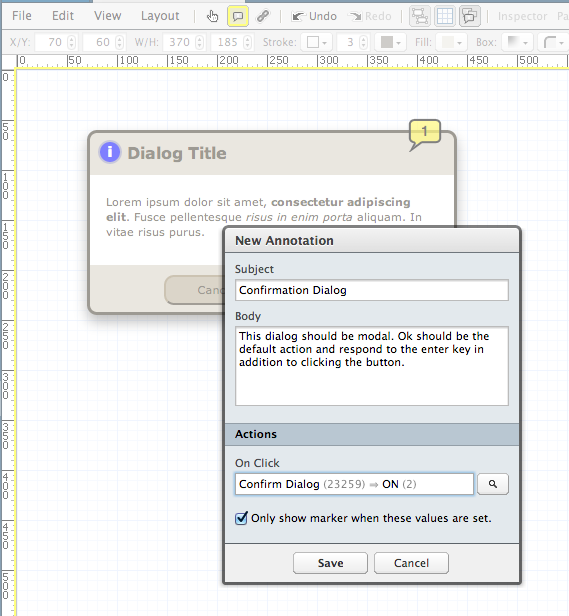 Annotations can be configured to use the on-click action. This is useful if you want to show or hide components when the annotation marker is clicked. The Actions section of the inspector allows you to configure which state values will be set when an annotation marker is clicked, or an annotation is selected in the Sidebar. In addition, you may specify whether or not you want the marker to always be visible ( box unchecked ), or only visible when the chosen state values are set ( box checked ). This visibility setting is useful when you want an annotation marker to be hidden from view until the UI elements that it refers to are made visible via user interaction ( ex: a dialog box ). As shown below, you can configure the on-click and visibility settings for an annotation.